No one marries to experience breakup, distress, love loss, pain, abuse, disappointment, distrust, violation, financial struggles and the like. However, many of us have experienced some of these things and more during our marriages. A marriage should reflect God’s love for His people; but when you have imperfect beings at the helm, the results can be anything but godly. This is why we should make every effort to keep God and His Word at the center of our marital relationship; the only way to truly do this is by faith. Faith takes what we desire, according to the Word, and bring it from the unseen in the seen realm. In other words, we can use the Truth of God’s Word to build the foundation for the type of marriage God says we can have. Regardless of the past, like our sins, God is able to renew and rebuild troubled and broken marriages. Now, I am aware that some of you may not want your marriages rebuilt—then I am not talking to you. But for everyone who do, you can have it by faith—providing you both want it. 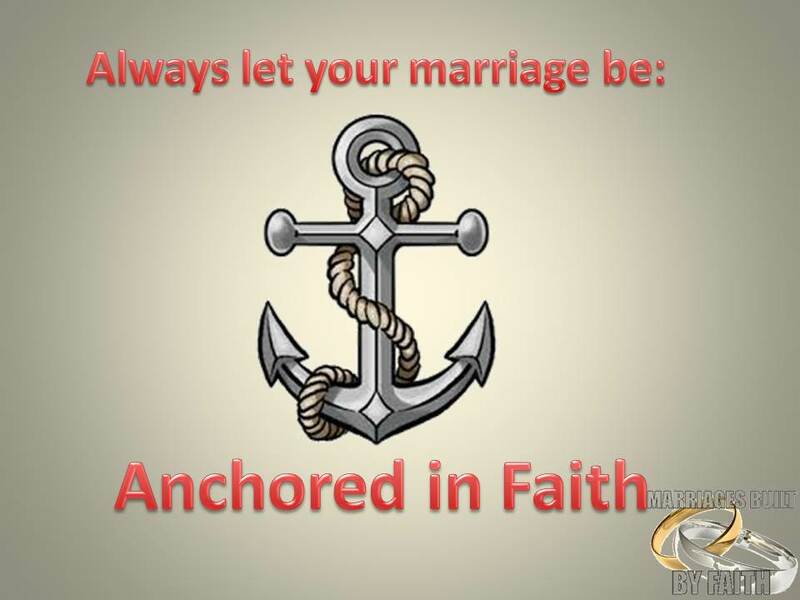 So, let your faith in God be your ‘anchor’. Thank you Brother Sebastian your words are wise, to have full Unity and Love in a Marriage, we do need as you said full Unity with God first and His to have His Love for Him and others but your right, it must be both not just one but regardless of what a Spouse does, two wrongs do not make a right. Jesus said Divorce shows a hard heart, it means there was no forgiveness by one or both. God hates Divorce but also violence, sometimes a refuge is needed for safety and if there is no repentance for sin in the marriage such as for Adultery and it continues then there will be no Godly Unity. You’re welcome Anne! Your comment is so true. In light of God’s Word and His desire for unity, we must use wisdom and be safe. I do not believe the Lord want anyone to remain in a threatening situation while believing Him for restoration (my opinion).